With over 200 entries, competition was stiff for the Employee Choice Awards: Tulsa’s Best Places to Work. Twenty companies were selected overall as winners of the Tulsa Business Journal’s award. The 20 companies represented four different categories based on number of employees. 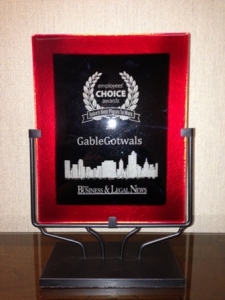 GableGotwals was among the five award winners for the Business Firms 65-200 Employees category. No other law firms were selected to be among the top 20 best places to work. The 20 companies were broken into the following categories with five winners in each category.